One day my Ranger was running perfect and the next day I started it up and it was idling very rough. It doesn't die, but it is idling so rough I am surprised it is still running. However once above about 1500RPM it seems to be ok and while driving it (even up hills) it seems to have plenty of power. It wasn't as bad at first and the MIL wasn't on, but then later when it got even worse the MIL came on. 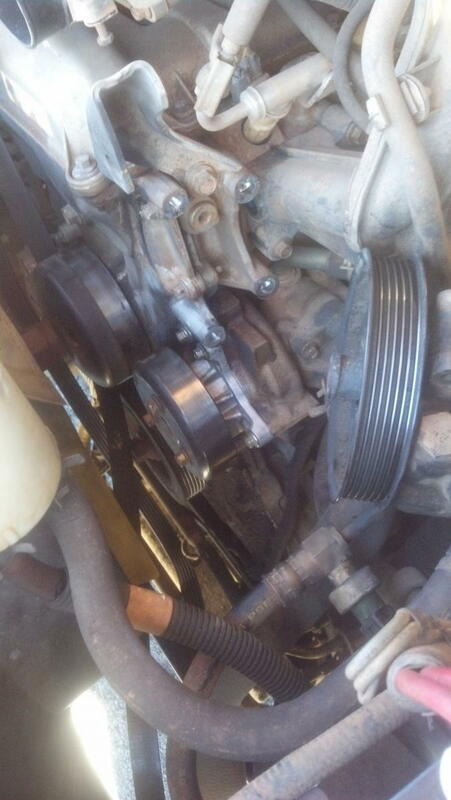 The code was P2195 (O2 Bank 1 sensor 1 lean), P301 (Misfire cylinder 1) and P300 (random misfire). My first thought was the IAC. I took it off and cleaned it, then just decided to try a new one and that didn't change anything. I have checked the resistance of the TPS and it changes smoothly, and I also hooked up my OBDII computer to the car and it varies smoothly from about 17% to 95%, so I am pretty sure it is ok. The MAF looks very clean, and it seems to have a reasonable value when read with my computer. (when I unplug the MAF it will run better for a few seconds then runs rough again). I took the O2 sensor off (the one before the cat) and the heater circuit seemed a reasonable resistance, and when I heated it with a torch it went to 0.95V and then when I took it away it quickly went down to about 0.2V. So that seems to work well too. I took the coil pack off, both primaries measured 0.8 ohms, both secondaries were 10.8K ohms. I have looked around for vac leaks, but I have heard and so far found nothing. The spark plugs look good (them and wires only have about 20k miles on them). I checked spark with one of those $8 gauges at autozone. The spark on each plug wire was >25kv so I think I can rule out coil and spark plug wires. I tried to do a vac test from the brake booster hose. The engine is running so rough that of course the vacuum is all over the place. However I notice that when I spray carb cleaner around the base of injector #1, the RPMs will pick up significantly. The engine is still not as smooth as it should be when I do this, but it always makes the RPMs really go up and at this time the vacuum is fairly stead at around 21. It is possible that I hear an air leak, but it is hard to tell with the engine noise and the fan running. But would this 21 value indicate that I do not have a significant vacuum leak? 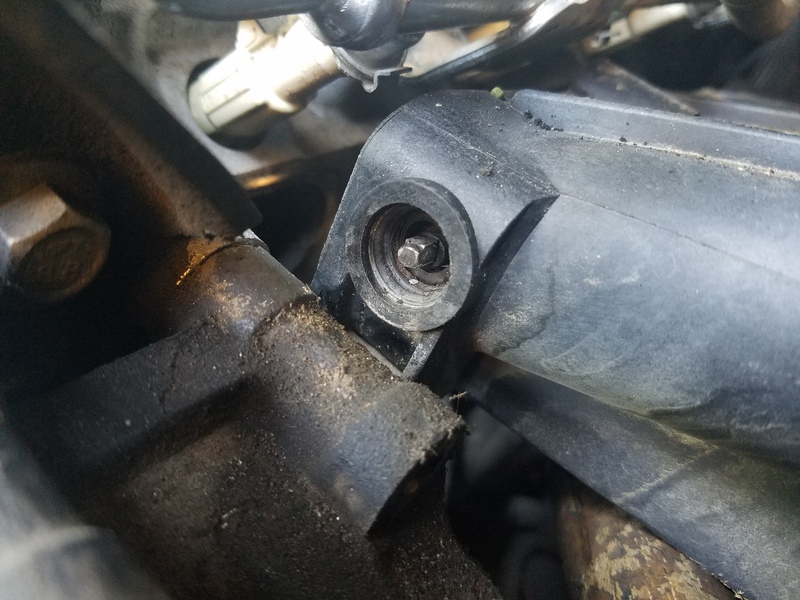 I had read somewhere on another forum that a guy with my exact problem had some plug fall out of the intake causing a vac leak, but he had to take the intake off to see it. Does anyone have any other ideas? Right now I am thinking a leak around the #1 fuel injector. While I was taking the intake off, I noticed the vacuum line going to the intake from the fuel manifold was cracked at the intake. This is close enough to the area where I was spraying carb cleaner that it could be the problem. But I continued removing the intake since I only needed to remove the 5 bolts to get it off. Once off, I notice that on the front side of the intake manifold where it is up against the back of the power steering pump, there was an obvious leak. 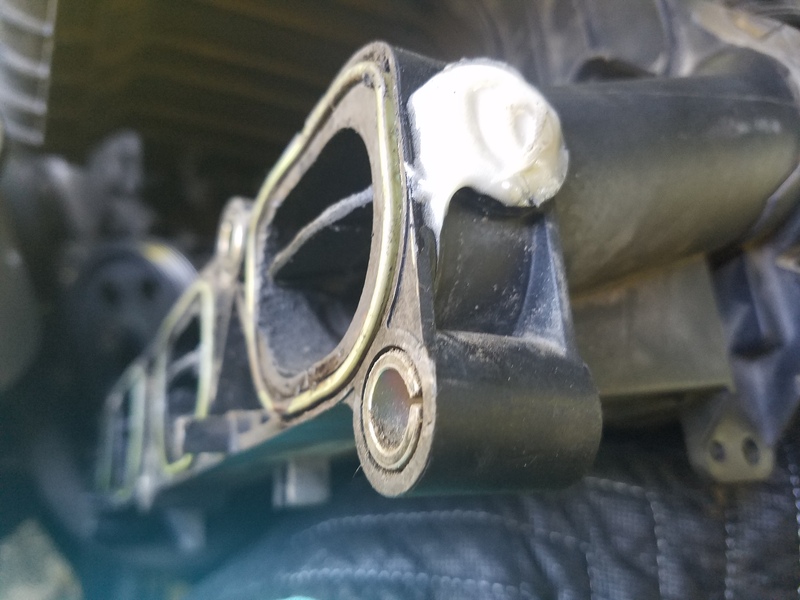 The swirl control valve (I have also seen this called intake manifold runner control valve) sits on the back off the manifold and controls butterflies that open and close at the intake just before it attaches to the head. These butterflies are all on a rail. The rail sits in the body of the intake on the front side near where the water pump is. It looks like some sort of seal or plug should be in here. 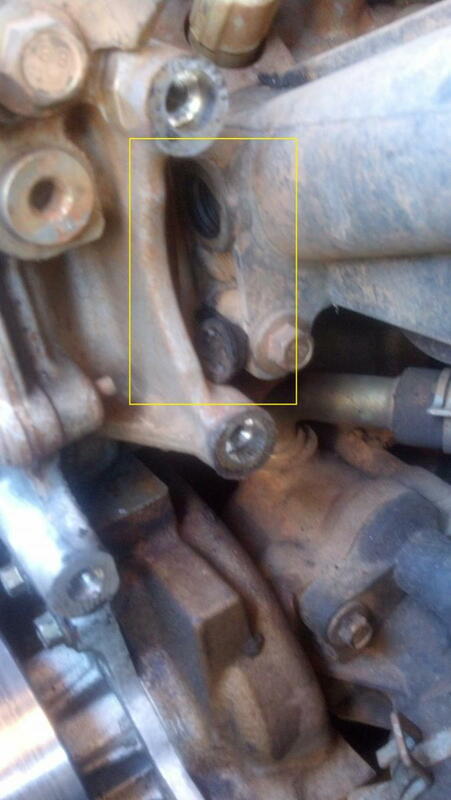 You can see in the pictures where I have circled in read on the intake and on the back of the power steering pump. It is just metal to metal so no way it would seal. Does anyone know what is supposed to be in here? Last edited by lemmy; 11-26-2011 at 03:24 PM. Read this one maybe be the same deal. It is the same device, but he was having a problem where the actuator opens and closes the butterflies inside the intake. That is on the back side. My problem is on the opposite end of the rail on the front side. So instead of a rich condition, I have a lean condition in cylinder 1. After reading the multitude of "rough idle" threads within these forums (all of which go nowhere, except for this one), lemmy comes up with the solution to my rough idle issue. 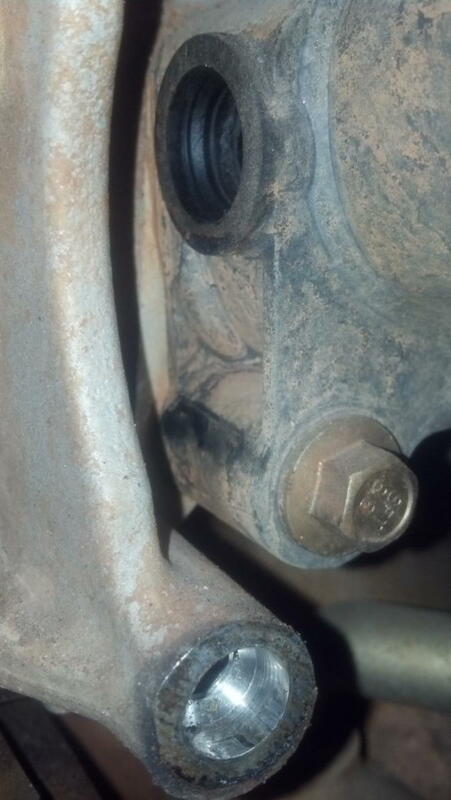 That stupid plug on the forward side of the Intake Manifold somehow popped out on my 2003 Ranger as well, and was the source of the vacuum leak which caused a serious rough-idle condition. Hats off to lemmy. 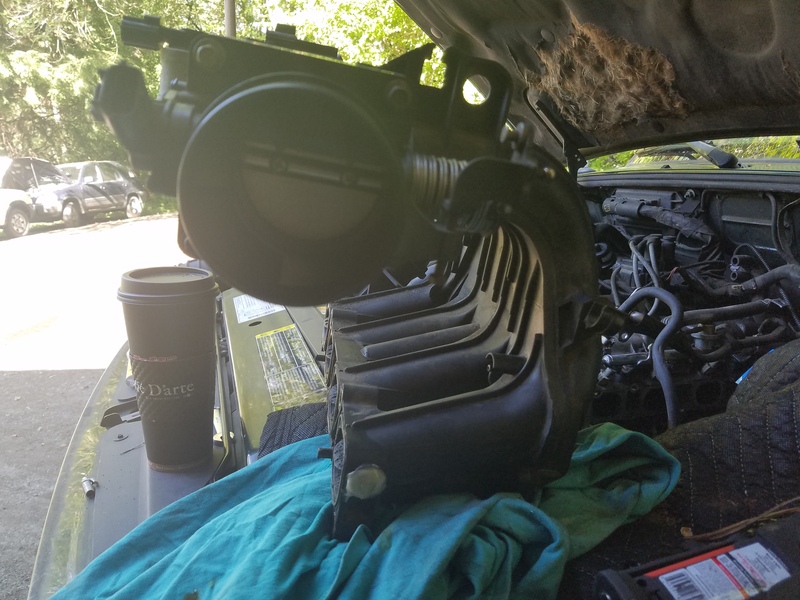 My wife and I pulled the Intake Manifold off, JB-welded a plastic washer into the forward IMRC rod port, filled the washer hole with JB-weld, reinstalled the Intake Manifold and viola; problem solved. The whole job took us 2.5 hours. If I haven't made it clear, lemmy rocks. My plug had popped too! I had the same symptoms on my 2003 and found my plug had popped too. Once I got it plugged it went back to idling normally. I would have spent $$$ replacing parts that didn't need replacing and wouldn't have fixed it. Thanks lemmy! My truck started running rough. Could not find a leaky hose or bad seal anywhere. Read this forum - presto-wammo - found the cap. Here's pictures of what Lemmy was saying. First pic is wide view of engine bay. I already have my power steering pump dismounted (not disconnected, just off the mount so I can get behind it). I replaced my water pump a couple of months ago and when I read what Lemmy said I knew it was going to have to be dismounted to get to the spot he was talking about. Last edited by Tanker3278; 01-03-2014 at 12:57 PM. A little closer in. You can see my plug still sitting there. Surprising since I drove it on bumpy roads for almost a month before I had time to work on it. Last edited by Tanker3278; 01-03-2014 at 12:43 PM. Here's what the plug looks like after you pull it out. Here's a close up of the port it used to cover. Since I still had my plug, I decided to reuse it. 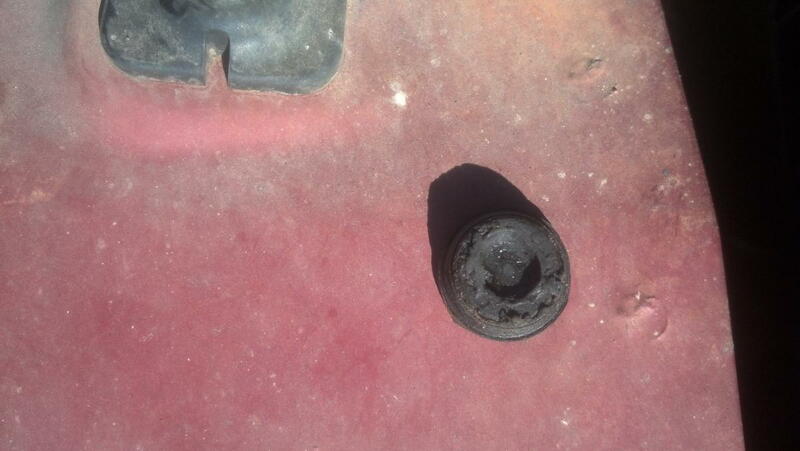 It was one of those hard-rubber plugs, but its age has made it solid/inflexible now. I cleaned it up, put a layer of RTV around the sides. Took a q-tip and cleaned the port. Put the plug back in the port, and put another layer of RTV over the top of the whole thing for good measure. Might not have been the best thing to do, but I used what I had on hand that didn't cost any money. Time will tell if I did it right. Currently waiting for the RTV to cure so I can go fire it up and see if it runs better. Thanks for this production goes out to Android phones for giving me the ability to take all these large, hi-res pictures and post them to you guys! Yep. That solved the problem. Idled smooth, ran smooth, plenty of power. Thanks for the pics, I was able to get my 2003 2.3 going this afternoon. Used GorillaGlue. Is it a PITA getting to it to see? Yes it is. And my fix didn't stay fixed. I tried RTV with the original plug the first time. That blew out the first time I ran it past 5k rpm's. Then I tried using the original cap with JB Weld. That lasted a bit longer, about 6 months before it blew out again. So now I'm resorting to what I hope with be a more permanent fix - capping it with a brass plug. So.....the following is me dismounting the intake manifold to be able to get at that spot and try to fix it one final time. ...............if this doesn't work I'm throwing a thermite grenade in, closing the hood, and calling it quits on this engine. I think instead of putting all this in this discussion, I'll just start a new one on Intake Manifold removal. Last edited by Tanker3278; 11-28-2014 at 09:37 PM. ironic this thread got bumped today, i stuck mine back in with silicone about a month ago, popped out last night . thinking about using gorilla glue and even stuffing a proper cut wooden block to keep the cap wedged on , then re-install the power steering pump ... I dont see how that could ever come out again... the bracket for the PS makes for a perfect backing to stick maybe a block of wood or steel , maybe with a little rubber backing... now is where you can become creative... anyways. first post thanks for havin me. Took my 2003 b2300 to 4k rpm then rough idle, really rough, I read this forum, went to my truck, slid a piece of card board behind the pump, tada, smooth idle, ,I then drove the truck to sears for the 10mm to remove power steering pump, I was amazed it was that easy, thanks 08/23/2015, 2003 b2300 with 115k miles, I already replace my egr hose that crumbled away at 60k miles. VERY THANKFUL FOR FINDING THIS. After trying many things on my truck that was idling horribly and misfiring, this was the issue. That damn cap on the intake manifold. THANK YOU LEMMY. Another bad plug in the manifold experience. Did a couple donuts in a parking lot and popped it. Used a pen cap as a bearing for the flapper rod, and then filled it with JB weld Plastic epoxy. If it runs better without the snout, then it could be the MAF Sensor. These are expensive parts as they include a processor, around $100 through most parts stores, so try to find other tests to confirm. Also, stay away from cheap eBay replacements. They are usually uncalibrated and untested hack rebuilds. A third cause of rough idle can be the Idle Air Control Valve. These are easily tested by running 12V to them and watching if the piston moves up or down. They generally run about $50. Both the MAF Sensor and Idle Air Control Valve tend to exhibit problems or quit entirely around the 100 - 120k mileage mark, so it's a good idea to replace both. Thanks for this old thread. I have my intake manifold out to do something else and noticed this issue. Sure enough, someone back in the day smeared a lot of silicone over the area. But the original plug is still there, so I'm guessing someone added the silicone as prevention. Looks like it needs to be redone. Since the original plug is still in place, I just want to back it up again. What do ya'll think of gluing in a penny or flat disk of PVC (cut from plumbing parts) with JB plastic weld? Or would say replace it with a brass plug like Tanker showed in his 2014 thread? I know this post is old.. but I have a question. Do you know the actual name of this plug?? Also, do you have to remove the manifold to remove the power steering pump? A thread can never be too old if it's helping people. Joined the forum last night specifically to solve this mysterious problem, found this thread and based on the symptoms described by others, I felt such a relief that I finally found the answer. Went to bed feeling very hopeful...got up next morning and shined a flashlight into that stupid little spot, saw a little black thing sitting there and life was suddenly all better! I spent soooo much time and felt sooo discouraged over the past couple months trying to get my truck to run. THANK YOU LEMMY! for taking the time and effort to post the great photos. My solution for now: I didn't use glue. I shortened the length of a rubber cork using a sharp knife, to a size a little bit larger than that little gap between pump mount and the manifold so that it's pushed in there, under compression, constantly pushing up against, and covering that hole. Make sense? I wanted to keep the hole nice and clean in case I want to remove the metal rod and swirl flaps in the future. Truck runs awsome now! Thanks everyone, this forum was so helpful. 95 2.3L Suddenly runs BAD! HELP! Idles rough, no power.